PLEASE CALL OUR OFFICES FOR CURRENT PRICES! Stacking and cartage services are available. Please call for a detailed quote. Buy now and save money! Commercial Accounts Welcome! Special Pricing on Volume Sales! Save on multiple cord orders. Buying in volume saves you money! 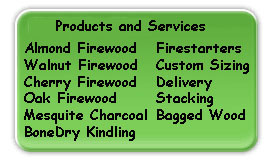 Bear Bottom Farms has been providing quality wood products for cooking and heating for 30 years. Clean-burning hardwoods such as Oak, Almond, Walnut and Cherry are available. Mesquite charcoal, soft-wood kindling and bagged yard scraps, too! 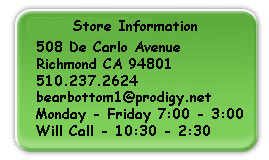 We also carry a broad line of Smoking Pellets and Chips. Popular available flavors include Alder, Apple, Cherry, Mesquite and Hickory. Bagged wood provides clean convenient storage. Special sizing available for Pizza Ovens and Rotisseries. Please click the 'Products' tab at the top of this page for a listing of our current product offerings. DELIVERY AND STACKING SERVICES ARE AVAILABLE. PRICES MAY VARY. PLEASE CALL FOR A QUOTE. Open year-round for commercial and residential customers.